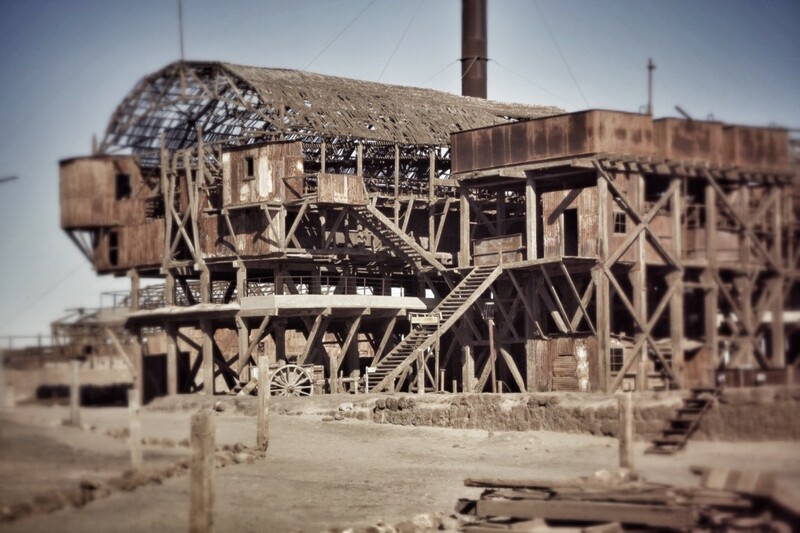 As a child, Westerns, whether on film, TV or in comics featured strongly and never more than when a ghost town was featured. There was something romantic and mysterious about the quiet solitude and eerie atmosphere of such places and in wondering how and why they became deserted. 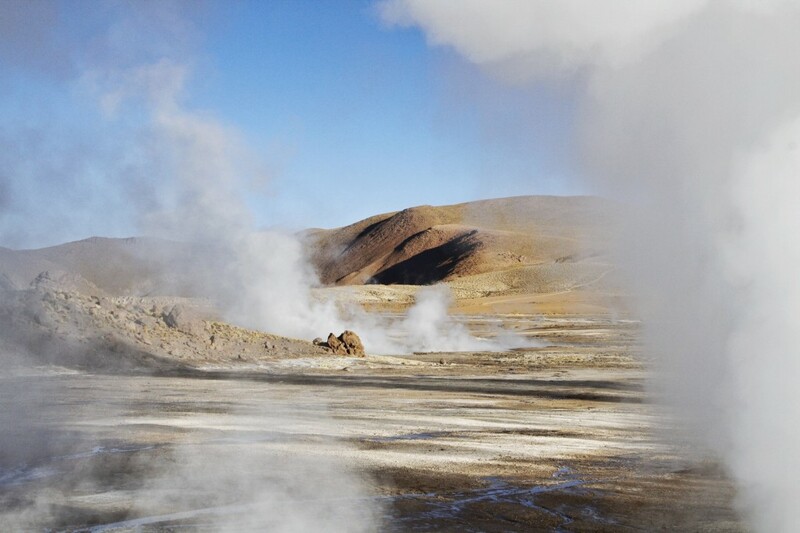 How then could I resist the opportunity of us visiting one such place deep in the Atacama Desert. 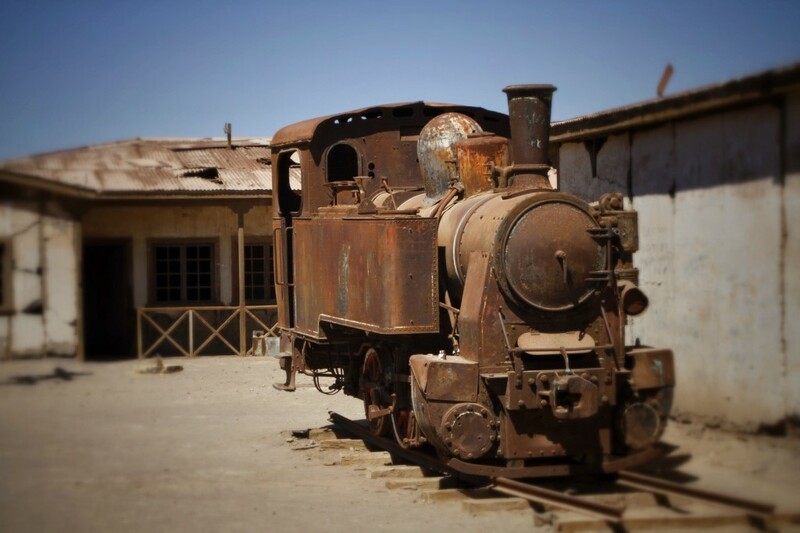 Humberstone, named after the British chemical engineer who founded it in 1872, was a self reliant town where saltpetre, an important ingredient of fertiliser, was mined and exported to Europe. It thrived for many years and housed its own theatre, schools, hospital and its hundreds of workers. 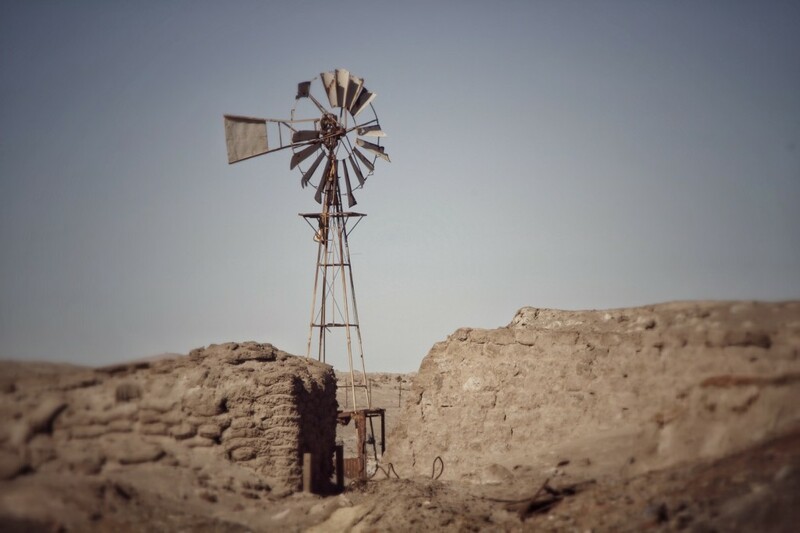 However, when World War 1 broke out the British blockaded and prevented its export and Germany developed a synthetic version which effectively destroyed the Chilean market and the town was abandoned to slowly crumble in the hot and dry environment in which it stood. Wandering around the old mining works and deserted town buildings, there still remains a tangible air of a community about the place despite its lack of human presence. We decided to stay a few days in the tourist town of San Pedro, which despite its trappings of souvenir shops, pricy restaurants and tour operators, still maintained a level of Chilean charm. Two excursions appealed to us and we indulged in both. Firstly was a trip to the nearby geysers where we had to arrive before sunrise as the chilling, very chilling, night air was required to turn the bubbling water into vapour as it reached the surface. Having wrapped up as well as we thought necessary we stood shivering while surrounded by huge plumes of hot steam and boiling pools of water. We walked amongst them as the sun rose, taking great care as to where we trod, and wondered at the sheer power and beauty of these subterranean displays. Hot chocolate was heated in the steaming froth before serving and then, as the air warmed and the spectacle subsided, we headed back for a welcome breakfast. 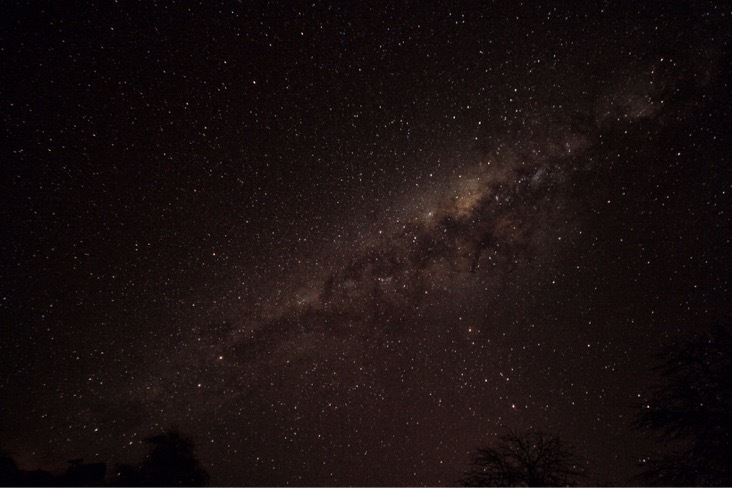 Our second trip was a night time excursion to a very dark place in the desert where light pollution was at its minimum and the sky at its brightest. Here we were treated to a lecture from an astronomer who described the night sky, told some history and then introduced us to the nine various telescopes pointing starward. We were invited to visit each at our leisure where we could view new born stars, old and exploded stars, twin stars and even the planet Saturn whose rings were clearly visible. While this was all going on we could gaze above us where falling stars would occasionally blaze across the staggeringly clear and stunningly beautiful Milky Way. One of the greatest pleasures for us while travelling untethered is the opportunity to roam at will and find little corners of life that would otherwise be missed. One such occasion arose in the town of Iquique. We had a whole morning to fill before catching our bus and decided to wander down to the sea. Carol had taken her binoculars as usual and we sat awhile watching the abundant sea birds that occupied the shore. Several Pelicans sat lazily on the rocks accompanied by an Inca Tern and Peruvian Boobies (stop sniggering at the back!). Once satisfied we had seen all we were going to we walked toward the masts of a large sailing ship to take a look but before we got there we came across a small alleyway that led down to the dock where the fishing boats were moored. Here was an abundance of stalls selling several species of fish and molluscs and an assortment of small plastic pots full of Ceviche. Some things we cannot resist and freshly prepared Ceviche is one of them and we bought a pot and sat and devoured the pickled morsels with relish. Carol asked the stall holder, in the broken Spanish I have not yet mastered, what type of fish had been used. Albacore she answered with enthusiasm adding “Grande” with a gesture indicating a very large fish. We were none the wiser but the terrible truth would soon be revealed. A few yards further and we reached the dock and looking over the edge we saw a floating platform on top of which lay a couple of large female sea lions along with an enormous male complete with impressive mane. A real treat which was to become even better when one of the fishermen pushed passed us and threw a bucket of fish entrails into the water. Pandemonium broke out as the three sealions were instantly joined by several others and the free meal was fought over in a frenzy of froth and splashing water. Quite a sight. Once the entertainment was over we decided to return to our hotel to collect our luggage and stopped off for a cup of coffee on the way. No sooner had we sat down than Carol suggested we go to a chemist to buy some cream for my face. “What do you mean?” I enquired indignantly. “You’re all blotchy” she wounded me further. I had noticed my eyes were getting sore and that I was itching around my neck and worry began to set in. “Can you look up the name of that fish I ate, Albacore wasn’t it” I asked Carol, getting a little more concerned as the itching started to spread. There are common allergies and there are rare allergies. One of the rarest and I believe the only species specific allergy in the world happens to be the one I have. An allergy to swordfish. At its worst my eyes swell, my neck swells to mump like proportions, my entire body breaks out into itchy hives and my respiratory system almost shuts down. The best way of controlling the affliction is to avoid swordfish, not a difficult or life restricting thing to have to do but I never considered avoiding Albacore, who would? Thankfully we had shared a very small pot and the attack was mild and Carol, being the grownup in our relationship, always carries antihistamine tablets for me when we are likely to encounter sea food and the crisis soon passed. Undaunted, we collected our bags and stopped for lunch before heading for the bus station. We had managed to sidestep a couple of tourist restaurants and found a tarpaulin covered area where fresh fish dishes were being served up to the fishermen and so we sat and ordered a bowl of soup each. When it arrived the first thing we noticed were the two crab claws reaching skyward through the misty brown broth whose surface was bejewelled with emerald flecks of coriander. Dipping the spoon through the liquid immediately met with resistance as it encountered clams filled with succulent flesh along with thin slices of urchin and other fruits of the sea. The flavours were deep and varied and we savoured every mouthful, happy in the knowledge that what we were eating could not be fresher or more traditional. Our culinary journey had begun.